While all the active volcanoes in Iceland get all the press and coverage. There are volcanoes in Iceland that are not so active and have remain dormant for thousands of years now and currently do not show any signs of activity. Some have some hot spring activity. But that is about it for them. The following volcanoes in Iceland have not erupted in historical times. Some have not even erupted in past 12.000 years best to my knowledge. But as history has proved in other parts of the world. An dormant volcano can start to erupt when it feels like it and without any warning at all in some cases. This is based on Global Volcanism Program data. So it might be subject to errors and updates. Hrómundartindur – Last eruption is unknown. This volcano is an stratovolcano. Grensdalur – Last eruption was in Pleistocene and its current status is Pleistocene-Fumarolic. This volcano is an stratovolcano. Grímsnes – Last eruption is believed to have taken place around 3500 BC. But this volcano is marked as tephrochronology. This volcano makes crater rows when it erupts. Geysir – This volcano last erupted in Pleistocene and is marked as Pleistocene-Geysers. This is an stratovolcano. Hveravellir – This volcano last erupted around the year 950 AD. It is currently marked as radiocarbon. This is an subglacial volcano. Hofsjökull – This volcano has erupted sometimes in the last 12.000 years. It has the marking holocene. This is an subglacial volcano. The second volcano in this system is not marked in GVP database. But that volcano is named Kerlingarfjöll. I do not know when it last erupted. There is also an embeeded second volcano in Hofsjökull volcano that is Independent from the main Hofsjökull volcano (yes, this is the case it seems). I do not have any idea when that did last erupt. Esjufjöll – This is an sub-glacier volcano in Vatnajökull glacier. Its last eruption is uncertain. But is believed to taken place in the year 1927. From the year 2000 this volcano has been showing signs of increased activity. This volcano is an stratovolcano. Fremrinamur – This volcano is last believed to have erupted in the year 1200 BC. This volcano is an stratovolcano. Þeystareykjabunga – This volcano last erupted around the year 900 BC. This volcano is an shield volcano. Snæfellsjökull – This volcano last erupted around 200 AD. It is currently marked as radiocarbon. This is an stratovolcano. Helgrindur (also known as Lysuhóll) – This volcano has no record of eruption. But it is thought that it erupted sometimes in the past 12.000 years. But exact time is not known. This volcano makes pyroclastic cones. This volcano is the smallest volcano system in Iceland. Tindafjallajökull – It is unknown if this volcano has erupted during holocene. But the GVP information say that dozen of small eruptions took place in early holocene. This is an stratovolcano. Snæfell – This volcano is located east of Vatnajökull glacier and south of Kverkfjöll volcano. It was once believed that this volcano was extinct. But new research into it has changed that opinion. This is most likely an stratovolcano. But I do not have it confirmed. This volcano has at least not erupted for several thousands years or more. Currently there are no information about this volcano in the Global Volcanism Program database. Skrokkalda – This volcano is dormant. But I do not know if it has erupted in historical times or not, but I do no think that is the case. I am also not sure what type of volcano it is. There are few more volcanoes missing due the fact that they are not in the Global Volcanism Program database. But I have them on a map that I own. So they are going to be added later when I update this blog post. This entry was posted in Esjufjöll, Fremrinamur, Geysir, Grensdalur, Grímsnes, Helgrindur, Hofsjökull, Hrómundartindur, Hveravellir, Iceland, Kerlingarfjöll, Ljósufjöll, Monitoring, Prestahnúkur, Skrokkalda, Snæfell, Snæfellsjökull, Tindfjallajökull, Volcano, Þeistareykir. Bookmark the permalink. Interesting .Thank you Jon. I didn’t realise Skrkkalda was a volcano in it’s own right. Do you think the activity shown on the tremor graphs is because it is waking up? That is due to activity in Hamarinn volcano I believe. But Hamarinn volcano had an small eruption last summer (July 2011). You can add these ones in the south at the SISZ, active during the last ice age, probably extinct now. These are very near Grimsnes: Burfell (stratovolcano) and Hestfjall (eroded shield volcano or a Surtsey case, now above water). And since Grimsnes does not look like a central volcano for me, Burfell could be the central volcano, just a couple of kms to the northwest. Around Langjokull, we found massive volcanic mountains, several are shield volcanoes like OK or Skjaldbreiður, or massive tuyas, like Eiríksjökull or þórisjökull. I never heard about when were these volcanoes active, but lava fields abound around them. Under the glacier it seems there are two calderas, Prestahnukur and another to the north, but these were active in the Holocene. Just like they discovered active fissures running accross Prestahnukur, maybe the other mountains could be also active. In fact the whole volcanic region northeast of Hengill is poorly described. There are a lot of volcanic ridges and cones to the east of Thinsvellir, with lava fields since the Holocene. On the other side of the country, there are also some interesting volcanic mountains in the northeast, to the northeast of Krafla and east of Ásbyrgi, on the eastern side of the rift. I am not sure if these are active or extinct, they are not even talked about, but they look very much like volcanoes to me. Þeystareykjabunga is the only shield mountain on the region described in the Volcanism Program. Finally, there is Þórólfsfell, a tuya quite close to Hekla and Eyjafjallajokull at the very end of the volcano belt (and towards where the rift is propagating, so maybe still potencially active); and Tungnafellsjökull, very prominent stratovolcano, to the north of Hamarinn, but independent from Bardarbunga. I read somewhere that it might have two calderas. I have an special category for extinct volcanoes. I will one day make an special blog post about more of the extinct volcanoes in Iceland. There is also an difference between an volcano and cones and such. Þórólfsfell is an eroded volcano tuff cone I belive or something of that short. But it is not an volcano, at least it is not marked as such on my map from what I can remember. Búrfell is a table volcano, not a stratovolcano. The Grímsnes system doesn’t yet have a own central volcano. Skjaldbreidur has an age of about 9.000 years, there are different opinions re. it being part of Prestahnúkur or resp. Hrafnabjörg volcanic system. There are active volcanic fissures in the northeast of the country. It is known about fissures from Askja, Krafla and Þeystareykjabunga reaching up northwards til into the bay Öxarfjördur. And these – placed on the northern part of the rift zone – are known active volcanic systems. The explosions which last took place around 2.500 years ago and formed Jökulsárgljúfur where within the period characterising (up to now) active volcanic systems – up to about 11.000 years. But in my personal opinion, it is just not possible to say about any volcanic system that it would be extinct – for example on the Canary islands and also on Snaefellsnes peninsula volcanism was revived after hundreds of thousands resp. millions of years of repose! A volcano per definition would include cones, they are just one of the forms it may take. From what I could tell, there was no harmonic. So this is tectonic or frost? This is tectonic. But this might also be an dike intrusion. But I need to have more earthquakes before I can be sure on that detail. Seems like a swarm has started in the same area. Whatever took place there is over now. There has been quite many deep quakes in the Vatnajökull area during the last days, so something was cooking there. We’ll see what happens and when. and I can put them in a straight line and compared with the Earthquake activity recorded from 1 January, 1997, to 1 January, 2008, in Eyjafjallajo¨kull and Katla from “Katla and Eyjafjallajo¨kull Volcanoes” by Erik Sturkell et al. Here is a picture of the Eldgjá fissure, she starts in Katla’s caldera, cuts trough the North East flank of the mountain and far into the dead zone. I think there are a few other fissures within the caldera as well. Further, a nice one on earthquake prediction methods: Greek geophysicists were expecting a major earthquake (M7+) to hit the southern Aegean Sea area, see more at http://geophysics.geo.auth.gr/new_web_site_2007/download_files/costas_CV/66.pdf (from year 2003). Statistically speaking, the area has been hit by M6´+ quakes on average every 30 years, and the last major one was at 1956 (M7.8). Many of these quakes have involved tsunamis (including 1956). 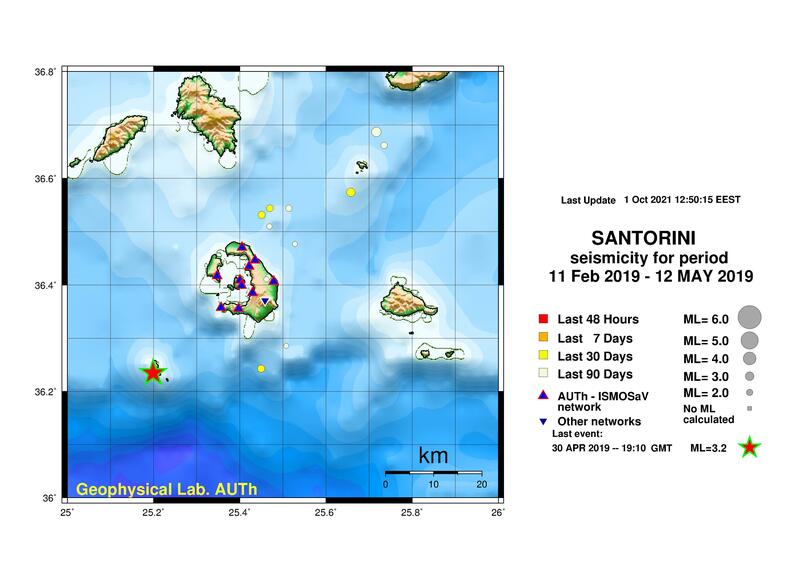 @Lurking: Can you draw a set of plots for Santorini island using this daily updated data? Morning Katla http://en.vedur.is/earthquakes-and-volcanism/earthquakes/myrdalsjokull/ Looks tectonic because of wavy pattern? Interesting those earthquakes in Vatnajokull. First some deep quakes in Kverfjoll, then a major 3.3 earthquake on northeast side of Bardarbunga caldera (Kistufell), which was now revised to be deeper than though (around 8km). This is followed now by medium size earthquakes in Hamarinn, but less deep (around 4km). Looks to me, there has been a lateral dike intrusion along Bardarbunga towards the southwest (Hamarinn). A fissure quite restless this year, and showing considerable inflation. Thank you for a great article; and, congratulations on getting the new geophone up and running – looks good. The storm in Iceland does not look nice judging by the Hekla geophone. Another “dormant” volcano in CA is showing signs of earthquake swarms! Mono Lake! Great work Jon, i hadn’t realised i had previously been to a few of those volcanoes (or rather the area) until i viewed the links!